As anyone with an internet connection knows, Couture Week in Paris was a little over a week ago. For many years I have followed fashion week after fashion week, experiencing it vicariously through Vogue editors and bloggers reports, occasionally posting exciting looks on twitter and more recently spamming my favorite looks from nearly every collection on tumblr. I’ve decided to start compiling my favorite looks and writing up trends I am excited to be seeing on this blog, and my first attempt is here. 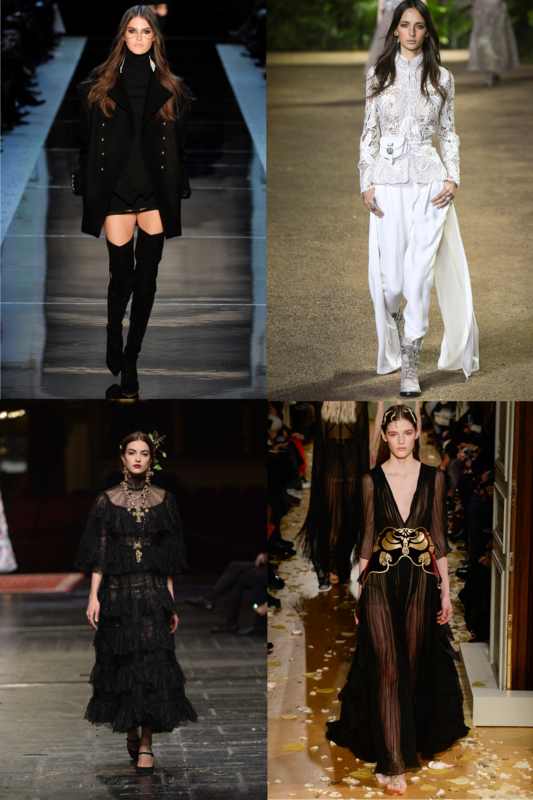 Top-to-bottom, let-to-right: Alexandre Vauthier École Polytechnique uniform coat; Elie Saab Neru collar top and punjab pant; Dolce & Gabbana Alta Moda black and gold cross dress; Maison Valentino sheer gown with gold detail. Why these four looks? To start, I am a sucker for École Polytechnique coats, and Vauthier created three spectacular versions in varying sleeve lengths with subtle tailoring differences. The long sleeved show-opener was my personal favorite, both of the coats and his entire collection. It was truly challenging to pick only one look from Elie Saab’s collection — the entire thing was nothing short of perfect. Starting with the concept of a young woman traveling on holiday to India, connecting modern silhouettes and themes with timeless Indian ones. Perhaps the best thing about Saab’s collection is that the Neru collars and sari sashes do not cross into costume territories. One of my favorite details are the beige boots and the pants tucked into them, which come as unexpected in such a loose and feminine collection, yet do not feel out of place. Dolce & Gabbana’s Alta Moda collection received a standing ovation when it debuted in Milan. One of my longtime favorite themes in D&G’s collections is their use of catholic imagery. Crosses feature heavily in many of their lines, couture and ready-to-wear alike. The comparative simplicity of the above look is what I like so much. The bright contrast of black and gold, the unusual but familiar silhouette, and the dark red lipstick. It is a vampy look that personally calls to mind what the most fashionable parallel universe version of Buffy the Vampire Slayer‘s Drusilla might wear. As Dolce & Gabbana’s piece reminds me of a vampire princess, Maison Valentino’s is more directly referencing an elvish princess. Barefoot with a floor length gown and decorated with bold jewelry, from literally head to toe.